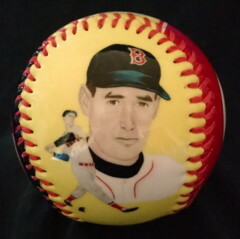 This Baseball Treasures "Ted Williams" Baseball features my original paintings. 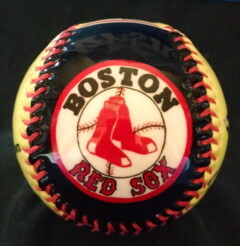 Side one has my double painting of The Spendid Splinter, Ted Williams. Also my initials. Click here for a closer look. 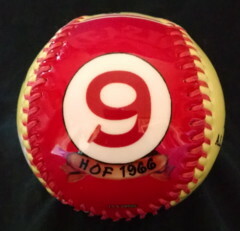 Side three has Ted's famous number 9 along with the year he was inducted into Baseball's Hall Of Fame. 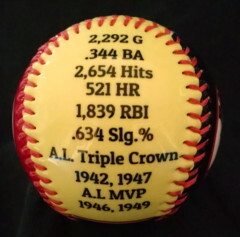 Side four lists some of Williams' lifetime stats and awards. 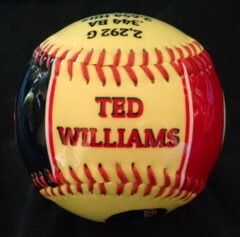 Side five, which is the top of the baseball, has "TED WILLIAMS". 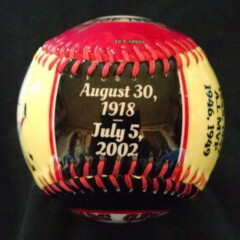 Side six, which is the bottom of the baseball, has Ted's birth and death dates. 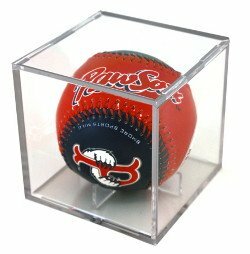 Shipping is FREE within the Continental United States. Please add $15.00 for International Shipping when ordering (Includes Hawaii and Alaska). Please add $15.00 for International Shipping when ordering (Includes Hawaii and Alaska).